GacUtil is a command line tool that allows you to install signed assemblies into the Global Assembly Cache. Unfortunately it is only available as part of the .NET SDK. This means that most Windows Servers will not have this utility installed. Now you should be able to run apps that use only the .NET 32 bit CLR. In one of our recent eCommerce projects, we needed to access images stored on a network share within our website hosted on the ASP.NET development web server. Our scenario deals with a web project in Visual Studio. The site uses some images stored on a network share. It is not effective to download and store all these images locally. When users access the site, the images should be loaded directly from the network share. For (e.g) When you access http://customsite/images/image1.jpg , the web server assumes that you have a images directory underneath your webroot and will look for a image1.jpg file. When users access the site, we need to pull image1.jpg from a network share. The technique to achieve this is really simple if you are using Windows Vista/7/Windows Server 2008. Step1: Map a network drive to the remote network share. In our example, when the user requests an image it is loaded from the images folder. This images folder is supposed to be found by the ASP.NET web server under the root folder of your web application. For e.g. if your web application is located under “C:\inetpub\wwwroot\webapplication1” then your images folder is usually under the webapplication1 folder. 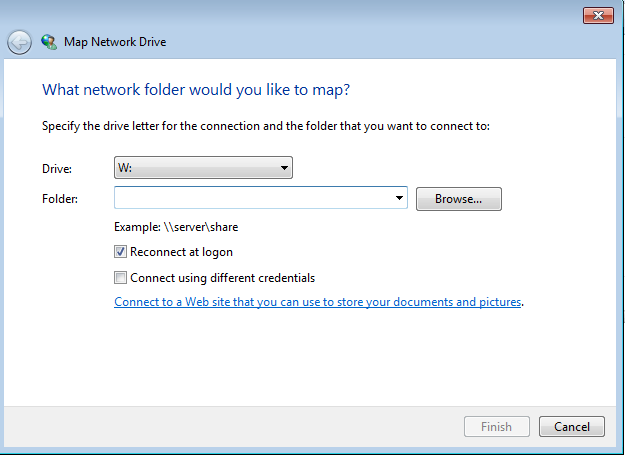 Now you should see Windows Create a Symbolic link to the network share.